This is a copy of a plan of the land leased by John Evelyn to the church wardens of St Nicholas, Deptford and currently occupied by William Snook. The boundaries of the land under lease to the church wardens of St Nicholas are highlighted in red. Along the boundaries are recorded the names of neighbouring tenants. Orintation points are marked on the margins of the sheet with the name of neighboring occupiers recorded. 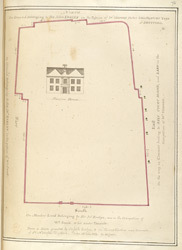 In the middle of the sheet is depicted the mansion house built on the land. The diarist John Evelyn took came into possession of the estate at Sayes Court through marriage to the heiress Mary Browne in 1647 and took up residence there in 1652. From 1694, Evelyn let Sayes Court to rent paying tenants.